Today is my last interview from YALLFest, and it's with another Pitch Wars superstar - Tomi Adeyemi. Tomi had the kind of Pitch Wars success story that all PW hopefuls dream about - tons of requests, lots of agent offers, a huuuge publishing deal and a movie deal. I was thrilled to get a chance to talk with her to learn how it all went down. Tomi, how did you become involved with Pitch Wars? I had just started dipping my toes into Twitter in like September 2015, so I just followed a bunch of agents, and I saw Pitch Wars! Pitch Wars! And I was like, "What is this?" so I googled it, and I was like this would be perfect for me because I was still working at my first book, and I was revising it, and I kind of hit a wall. So I was like, "I've got to enter!" And then I was like, crap - it was a little more colorful than that - because it was exactly three weeks from the submission window, so everyone was finding out they were in Pitch Wars. So for a whole year, well eleven months and one week, Pitch Wars was on my radar because I had just missed it. So I kept revising my book, I queried it, and then we get to four months before submitting for Pitch Wars 2016, and I knew it was on my radar, I was going to do it, but then I was just like, "Oh, but my first book isn't gonna go anywhere," because I'd had enough helpful rejections that I knew that my first book was not sellable. But I'd also just had the idea for this book, but it didn't exist yet. So in May I outlined the book, in June I was like, "You have sixty days to get something hopefully good." Because I knew I would have a really good shot of getting in with it, but it had to exist, and it had to not be the crap that is the first draft. So I like pooped out a first draft in June, revised to a second readable draft in July, submitted in August. I literally went crazy, I went crazy, I was like a mad woman. There was a point where I though I was a lawyer because I'd been watching The Good Wife, you know, I had an argument with my boyfriend where I was just like, "You're obstructing my case!" Like, I lost it. But I made it. Yeah, so it was fate. But I had to hustle because I was like, I'm not going to miss this, I've been waiting all year. I was not going to not get in because I didn't apply. So the book had to come into existence. For future Pitch Warriors, how did you select the mentors you applied to? Oh, that's easy because it's research, and I'm a Ravenclaw. I like Excel sheets, I like lists. I think Pitch Wars is so great because whether you get in or you don't, you learn so much, and you can also meet your writer people that are gonna be with you forever. But, yeah, everyone has their Pitch Wars wishlist, and they're pretty specific. There was a good amount of people looking for diverse fantasies, but then I'd be like, "Okay, what are your favorite stories?" Like anybody who loved Avatar - I'm obsessed with Avatar, and I pitched Children of Blood and Bone as African The Last Airbender, so if someone loved Avatar as much as I did, I knew we were a fit. So it was really easy to narrow down. Also because people give away critiques of all kinds, so that's a really helpful way to narrow down your list. Because I remember my mentor was on my long list, but then I won a query critique, and the person who critiqued my query was like, "You should really send this to this person, she would love this." And so that moved her from 'I'm considering all these people' to number one. I know you’ve told this story a thousand times, but can you tell us how Pitch Wars went for you. So the revision was a dream. My mentor, her name is Ashley Hearn, she's currently an editor at Page Street, and she's brilliant. She had another mentee this year, and I was telling her, "Hey, by the way, savor this time revising because it will never be like this again." Because Ashley sent me this ten page edit letter, and I had gotten one edit letter before, and it didn't feel right, and it's confusing because this person has more experience, but this doesn't feel right, but with Ashley, oh my God, everything was -- I was nodding every single line of this single-spaced ten page edit letter. So she just got it. So that made the two months peaceful. Every time I'd had to revise before that, I'm doing things I'm thinking I'm making it better, I'm not entirely sure. I didn't know what the book was. Like, I knew what I did, but I didn't know what it was, I didn't have a chance to read it before I submitted it, so I didn't know what it was, so to have a guided person who was so clearly right being like, "I think this, this." And I was like, "You're right!" And I told her, "Ashley, you spoiled me because revision is never like that again." It was pretty calm, and two months is a long time to revise. Someone might say it's not, but now that I'm at this stage - it is. So it was very peaceful for that reason, too. So I loved it. And then the agent round I was crossing my fingers. There had been some hype around it, so I was like hopefully something works out, but I wasn't prepared for all the requests that came in and then all the offers that came in after that. Which was crazy because my first book that I tried to get published, from first draft to querying was about three or three and half years. And then over a course of around four to six months ... with my first book around four to six months I got twelve full rejections from requests, with this book it was six days and I had twelve offers. So I was just like, "What is this?" It was a complete whirlwind. But luckily you get to talk to clients of agents, and they were really helpful in helping me figure out what I wanted for myself. And then I got on the phone with my agents Hillary Jacobson and Alexandra Machinist, and it was like, "Ahhh, okay, yeah." There were all these things about "the call," and when they knew, but it wasn't just because there was a magical elf that sprinkled dust. We clicked. But I had clicked with other agents, too, but it was just, "Okay, we want the same things." They were also the first people to tell me, "Oh, your book needs a lot of work." And I was like, "Do tell more." I was like, "Okay, this is it," and I felt it. And I knew it was it not because it was just so magical, like it was a great call, but because that night was the first time I stopped feeling stressed. I had been so stressed out because I'm like, "How do I pick? How do I pick? This person's great! This person's great!" But that was the first night I was not feeling stressed, and I was like, "Oh, I'm not stressed any more because I know." How was it being on the other side as a Pitch Wars mentor this year? It was so wonderful because you get to go through it without all of the stress. I mentored with Kit Grant, her book is called A Court of Miracles and it's debuting Fall of 2018, and it's wonderful. We met as mentees, and we clicked instantly. Our mentee this year was like, "When did you guys know you were going to be mentors?" And I was like, "Two days before we got in we had determined to do this." It was so much fun. You know, I wanted to give back to something that had given so much to me. Like our mentee now, Gillian Berry, we're like, "Hey, by the way, you're our critique partner now, just so you know." Because you find great people, and I think her book is brilliant, I hope you hear about it soon. So, yeah, it was great. It was great. It's a lot though. So I don't think I can do it again next year, but I'm really happy that I did it this year. I'm tying up book one. We're still hoping to put the bow on it this month. Then I'll sleep for two weeks. And then I'll start the sequel. I like to write with an outline, so I want to get my outline for book two and book three. And then I'll feel that same sense of the stress going, because when you don't fully know what's happening next ... I was telling someone now that this is almost done, I'm finally getting in that mode again of like, "Oh, this is a beautiful thing, that would be beautiful." Like looking up at the moon or something and being like, "Huh." So I'm getting back into that mode of being inspired and stuff. So I'm excited for book two, so I'm going to stay excited for as long as I can because every author has told me it will kill me. So I was like, "Let me stay as happy and optimistic about it for as long as I can." We hope you stay happy and optimistic for a long time! Thanks for chatting with me, Tomi! Readers, have you written and revised a new book in just a few months? Have you received revision notes that clicked in a special way? Does outlining a book help mitigate the stress of writing it for you? Share your thoughts about the interview in the comments! 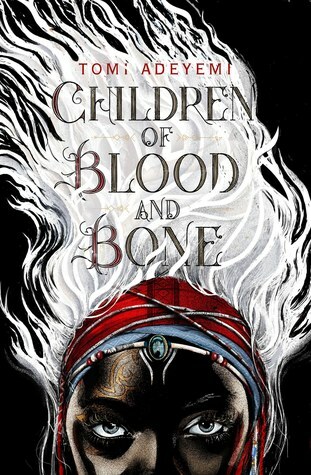 Her debut West African YA Fantasy novel is CHILDREN OF BLOOD AND BONE (Holt Books for Young Readers/Macmillan). The CHILDREN OF BLOOD AND BONE movie is in development at Fox 2000/Temple Hill Productions with Karen Rosenfelt and Wyck Godfrey (Twilight, Maze Runner, The Fault In Our Stars) producing it.